Maximum length is about 10.2 cm (Day, 1889), longest specimen in collection 3 cm by author. Surface feeder and it feeds on Diatom, Algae, Crustaceans, Rotifer, insects etc. 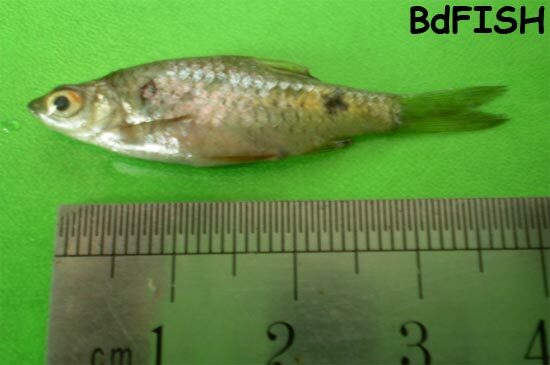 this is a small fresh water species of the genus Barbus found in ponds, beels, jheels, streams and rivers of Bangladesh. Puntius ticto is a very plentiful shoaling fish remaining appreciably smaller in domestic aquarium. This barb is also considered of medicinal value. Besides it is common almost everywhere and cheap price and delicious taste. This fish is available in study area but listed as vulnerable in Red Book of thereatened fish of Bangladesh by IUCN Bangladesh (IUCN Bangladesh, 2000). Public awareness builds up and stopped indiscriminate use of pesticide or herbicide for conservation of the species. Bhuiyan, A. L. 1964. Fishes of Dacca. Asiatic Society of Pakistan, Dacca. p 35. Day, F. 1878. Fishes of India, being a natural history of fishes known to inhabit the seas and freshwaters of India, Burma and Ceylon. William Dawson & Sons Ltd., London, Vol. I: p 576. Hamilton, F., 1822. An account of the fishes found in the river Ganges and its branches, Edinburgh & London, Fishes Ganges, p 314. Islam, M.A. 2007. Puntius ticto (Hamilton, 1822). In: Siddiqui, K.U., Islam, M.A., Kabir, S.M.H., Ahmed, M., Ahmed, A.T.A., Rahman, A.K.A., Haque, E.U., Ahmed, Z.U., Begum, Z.N.T., Hasan, M.A., Khondker, M., and Rahman, M.M. (eds.). Encyclopedia of Flora and Fauna of Bangladesh, Vol. 23. Freshwater Fishes. Asiatic Society of Bangladesh, Dhaka. p.84. Menon, A. G. K. 1974, A Checklist of the Fishes of the Himalayan and the Indo-gangetic Plains. Inland Fisheries Society India, Barrackpore, p42. Munro, I. S. 1955. The marine and freshwater fishes of Ceylon. Dept. External affairs. Canbana Publications. p 41. Qureshi, M. R. 1965. Common Freshwater Fishes of Pakistan. Government of Pakistan Press, Karachi. P.22. Rahman, A.K.A. 1989. Freshwater Fishes of Bangladesh. The Zoological Society of Bangladesh, Department of Zoology, University of Dhaka, Dhaka-1000. p 131. Shaw and Shebbeare, 1937, The Fishes of Northern Bangal. Journal of Royal Asiatic Society of Bengal Science. p 43. Talwar, P. K. and Jhingran, A. G., 1991. Inland Fishes of India and Adjacent Countries. Volume 1. Oxford & IBH Publishing Co. Pvt. Ltd. New Delhi, Calcutta. p 291. Visited 2,907 times, 1 visits today | Have any fisheries relevant question?